Harlequins: Brown; Yarde, Hopper, Lowe, Monye; Swiel, Care; Lambert, Ward, Collier; Matthews, Robson; Trayfoot, Clifford, Easter. Replacements: Gray, Marfo, Sinckler, Twomey, J Chisholm, Dickson, Casson, R Chisholm. 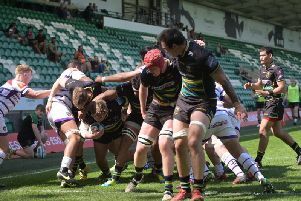 Saints: Foden; K Pisi, G Pisi, Burrell, North; Myler, Dickson; A Waller, Haywood, Ma’afu; Dickinson, Day; Clark, Wood, Manoa. Replacements: McMillan, Corbisiero, Denman, Dowson, Nutley, Fotuali’i, Wilson, Stephenson. Outs: Harlequins: Robshaw (shoulder), Wallace (hand). Saints: Fisher (toe), Hartley (suspended). Tom’s preview: Aptly, Saints will end the most successful year in their history at the scene of one of their greatest triumphs. Twickenham is the venue for the final match of 2014 and Jim Mallinder’s men will look to round off a magical 12 months with another memorable success. Okay, so a win against Harlequins in the grandly-titled Big Game 7 this Saturday won’t quite match seeing off Saracens in such dramatic fashion in May. But it would be a great way to pull the curtain down on a double-winning year. For so long, Saints had strived to be crowned kings of England. And when that day finally arrived on May 31, it did so in the sweetest possible fashion. Alex Waller’s outstretched arm snatched glory from under the noses of a Saracens side who have got up the nostrils of Saints once or twice in recent times. There was an inevitable outpouring of emotion, a banishing of demons from 12 months previous, when Leicester piled misery on their local rivals. But while the Tigers have somewhat stagnated since that day at HQ, Saints have gone from strength to strength. Their title triumph has not sated the appetite for success. On the contrary, it was fuelled the fires at Franklin’s Gardens, where there is a real desire to do it all over again. And a desperation to ensure Twickenham is visited twice in 2015, with the Champions Cup showpiece scheduled to be played at the famous stadium. Firstly, though, Saints want to end this year the way they have lived through it. They will want to make sure it is not a case of after the Lord Mayor’s show, following the sensational success against Tigers last weekend. And with a capacity crowd set to watch this festive cracker and memories of May floating around the Saints dressing room, they will have all the motivation they need.